Ao no Exorcist was licensed by Aniplex and simulcasted in North America. Due to the fact that the source material is on-going, the anime adaption of Ao no Exorcist diverges from it at key points, leading to an anime-exclusive ending. One of the constants of many religions is the idea that sin and evil stem from a higher power. In some cases this means another deity that works in opposition to all things good, but for Christianity, Islam and Judaism such things are viewed as the domain of Satan (or "Lucifer, Fallen Angel, Prince of Darkness, Bringer of Light, Ruler of Hell, Lord of the Flies, Father of Lies, Apostate Supreme, Tempter of Mankind, Bringer of the Apocalypse, Old Serpent, Prince of this World, Seducer, Accuser, Tormentor, Blasphemer" - Glen Duncan). Whatever name is ascribed to this being, the idea of him being the enemy of all things good is so deeply ingrained in society, he is usually depicted as the epitome of darkness and evil. While there are tales out there that try to cast Satan in a different light (for example, DC Vertigo's "Lucifer"), most writers find it easier to go with the prevailing opinion - which is a bit ... lazy to be honest. 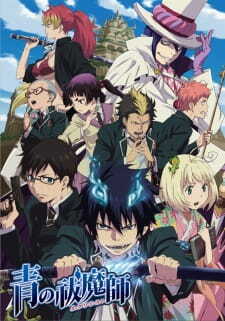 Adapted from the ongoing shounen manga by Kato Kazue, Ao no Exorcist follows the adventures of Okumura Rin, a boisterous teenager with superhuman strength and a problem controlling his temper. Together with his younger twin brother Yukio, they live in a small Christian monastery run by their father, Fujimoto Shiro, and several monks who have helped raise the two boys. The series opens with a group of priests who are frantically praying in unison, but one by one they are being killed by a mysterious blue fire. The scene shifts to Rin, who has just punched a delinquent for shooting pigeons with a crossbow. Because this is a shounen anime, the plot adopts the action oriented, fight-of-the-week format that is so common in the genre. While this method is formulaic, it does have two advantages, the first being that the story becomes very easy to follow. Overly complex details and anything truly thought provoking have been discarded, which is more than a little ironic as, in true shounen anime style, this simplistic approach is reflective of the content of the series. The second advantage is familiarity, and while it doesn't seem like an important factor, it does play a key role when it comes to enjoying this show. When it comes to looks, Ao no Exorcist is on surer footing, although a part of that is because this is a manga adaptation. The majority of the character designs are very typically shounen in style (even down to the short, bald guy), but while the source material adds a degree of refinement to their composition, there are also a few inherent limitations. That said, there's a surprising degree of creativity in the supernatural elements of the series, and a few of the weird and wonderful concepts really steal the show. There are also a few imaginative settings that make a nice contrast to the rather humdrum everyday scenery, and when everything comes together the overall effect can be colourful and slightly outrageous (in a good way). As for the animation, A-1 Pictures have done a decent job for the most part, even with the typical shounen posturing and theatrics. The characters move well, if at times a little unrealistically, and the majority of action scenes are fluid and well choreographed. Unfortunately there are some noticeable occasions where the standard drops, and sadly these aren't limited to periods of frenetic activity. The strong shounen theme is prevalent in the two opening sequences, both of which are filled with action, posturing, and a smattering of angst. In addition to this, the two introductory tracks, "Core Pride" by Uverworld (episodes 1 to 12), and "In My World" by Rookiez Is Punk'd (episode 13 onwards), are very typical rock songs that one might find at the beginning of any shounen anime. Ao no Exorcist also features two ending sequences, the first one being a CG "journey" through a city that is accompanied by "Take Off" by South Korean boy band 2PM. The second features a montage of the characters against a variety of patterned backgrounds, all to the tune of "Wired Life" by Kuroki Meisa. The rest of the soundtrack is features dramatic orchestral pieces and strange little comic relief ditties, and while these are generally well choreographed, as a whole there's nothing really special about the background music. One of the biggest problems with the shounen genre is that it can often be too formulaic, and nowhere is this more apparent than in the dialogue. The script appears to have been written by people with no idea of how teenagers actually talk, and the conversations are filled with pointless banalities, angst ridden diatribes and cumbersome bravado. Everything's a bit too contrived, and to further compound matters, the voice actors have obviously been instructed to play their parts with extra "oomph". The result is that emotions like anger, frustration, joy, fear, etc, often involve lots of shouting, while the rest of the acting has enough ham to start a business making sandwiches. The characters are a veritable "who's who" of stereotypes, and it can sometimes seem as though the mangaka has followed the instructions in "How To Make A Shounen Character" to the letter. Rin is the typical lead male - all brawn, very little brains, and tries to solve every problem by hitting it, and surrounding him are people who epitomise their archetypes. In addition to this, Ao no Exorcist makes the age old mistake of assuming that overcoming trials and tribulations equals development, and while some of the characters do learn a thing or two over the course of the series, much of what passes for growth is nothing more than window dressing on a mannequin. In all honesty the only interesting person in the whole show is Yukio, but given how shallow everyone else is, this may not be saying much. Ao no Exorcist isn't a new concept, and much of the inspiration for the story has obviously come from Mike Mignola's "Hellboy". The sad part is that although the latter work is a gripping supernatural horror/thriller that touches upon many different cultural beliefs, legends and aspects of folklore, virtually none of that is present in this anime. The decision to make this a shounen tale has placed severe limitations on what can and cannot be done, and this means that the narrative can't achieve the atmosphere, the tone, or even the level of complexity of Hellboy. Which brings us back to the latter portion of the anime. Once the series moves away from the source material the story takes a slightly darker turn, and several themes are introduced that, if they had been used earlier, could have raised the show above mediocrity. Unfortunately these concepts are only lightly touched upon, which is a shame as there was an opportunity to take the anime in a direction that would have made it far more interesting than it actually is. That doesn't mean it should have gone done the path used by The Omen trilogy though (i.e. Rin becomes The Antichrist), but it would have been nice if the wistful, almost melancholy desire of his father was examined in more detail. With all of its flaws it may seem as though Ao no Exorcist has nothing to offer, so it's surprising that the show is reasonably enjoyable. That said, the best way to treat this anime is to think of it as a rather long action movie that has difficulty getting to the point, and if it's watched for the sole purposes of no-brain entertainment, then viewers can expect a decent return for their time. That said, with two live action movies, two animated features, and a world of difference in content, some people may find Hellboy a better proposition. I started this show with high hopes; needless to say I was let down. I liked the aesthetic, the characters seemed ok and I liked the premise. All signs pointed in a positive direction. Unfortunately, that's exactly what this show lacked: direction. Aside from establishing the premise, very little is done to advance the plot throughout the show. Most of the show is episodic, and the archs don't build up to anything. It really seemed like the creators didn't know where it was all supposed to go. One of the things that disappointed me was the fighting, or the lackthereof. From the beginning they establish a universe with potential for awesome, supernatural fighting, and even introduce a number of characters that would probably be pretty awesome for that kind of show. In the end, there was really only a couple of fight scenes, and most (if not all) of them involved the same couple of characters. It's also disappointing considering those fights ultimately meant nothing. They had nothing to do with any overarching plot because there was none; at least, not until very late in the show. The ending for this show was pretty bad. It didn't do anything interesting with what the show brought to the table, and was downright terrible from an action standpoint. If it had introduced some kind of twist or something, then it might have redeemed the show a little bit, but it didn't. Since both the action and the plot were nonexistent, there's really not much reason to like this show, though I will give it that the aesthetic and comedy were nice. It's a show that could have been nice had they decided whether or not fighting was what they were going for, but they couldn't make up there mind, and in the end they had nothing to show for it. An interesting enough premise, but Blue Exorcist turns out to be just another school-setting shounen with a main character with the typical daddy complex and a shallow/unfinished romance. None of the OSTs stood out to me, but I loathed the jazzy opening. I really enjoyed Rin and Shirou's relationship, and Shiemi's smidgen of character development was nice to see. But there was little depth in the characters otherwise. Instead, the writers took the easy route and focused on Izumo's (spoiler) easily-predictable somewhat transformation and Rin and Yukio's unorthodox relationship (which came off as awkward and forced to me). Though I must applaud the series for (spoiler) letting Noriko go, which shows some resolve. The daddy complex was nothing new, though I thought the religious overtones and occasional references were interesting and almost Neon Genesis Evangelion-esque. I was rather let down by the series after hearing so many good things from friends. The first few episodes are still wonderful and emotion-filled, in my opinion, but the rest of the show fails to follow-up and the conclusion is horrifically anticlimactic, (spoiler) with the exception of the relationship between Rin's mother and Satan, which I found surprisingly touching. Overall, it feels like a textbook shounen that could have taken an edgy turn with the religious overtones and instead wimped out. Ao No Exorcist is set in a battle of exorcists versus demons. It is a typical shonen with a good main character as the backbone. The backdrop of the story is that Rin and brother Yukio are the sons of Satan and a human mother. Rin inherited the demonic powers, while Yukio didn't. They are taken in by the current Paladin, Shiro, who raises them as sons. Soon, they are thrust in an ongoing battle of the Exorcists versus Demons. The story gets off to a very fast start, but from what I understand, lack of material for the spots the manga covered caused some more prolonged fillers than usual. Towards the end when the story picks back up, there are some "jumping the shark" moments which try to add to the intrigue and plays well on the Rin's character, but ultimately falls flat. Rin makes an excellent main character. As the son of Satan who wishes to fight demons his very existence challenges the traditional views of the vatican, the major "good guy" base, in the series. He's foremost, a character you like to root for. His brother Yukio is somewhat a foil to Rin. His personality is pretty much the opposite of Rin's, and even his weapon choice (guns) are contrary to his brother's (A sword). The strong point about both characters are that both of them have a good mix of personal strengths and weaknesses. As good as the brothers are, the supporting cast fails to meet the same marks. Most of them have some sort of character episode or small backstory, but none of them really have any true development. In comparison, a show like Soul Eater (while having twice the episodes) managed to handle all of the characters in a way that made all of them seem important, this is not true for Ao No Exorcist. The show has a fairly good mix of comedy and action. Some of the more comedic episodes are actually the stronger ones as they tend to focus more on a characters personality rather than the kinda middling story. Ao No Exorcist is nothing new to the Shonen world, it suffers from some pacing issues and a bland supporting cast, but has strengths with the mains and overall theme. It's a decent show with some demons to deal with.